Michelle Akers played soccer at the University of Central Florida where she was selected as 4-time NCAA All-American. She was Central Florida’s Athlete of the Year in 1988-89, the all-time leading scorer in UCF history, and won the Hermann Trophy in 1988. UCF retired her #10 jersey. Akers played for the 1st ever U.S. Women’s National team in August 1985 and on the first international trip for the U.S. Women. She scored the 2nd goal in the history of the program against Denmark. Akers scored 15 goals in 24 games for the U.S. from 1985 to 1990 before scoring a team record 39 goals in 26 games in the 1991 season alone. 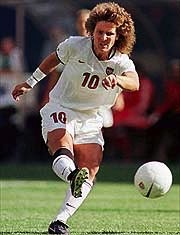 In 1990 and 1991 she was named the United States Soccer Federation’s Female Athlete of the Year. She was also the lead scorer in the inaugural FIFA Women’s World Cup in 1991 in China, scoring 10 goals, including five in one game. This led the U.S. Women’s Team to its first world championship, by defeating Norway 2-1. Akers scored both goals. In 1996, Akers was again a member of the U.S. Women’s National Team at the 1996 Summer Olympics in Atlanta where they won the gold medal. On June 7, 1998, she was awarded the FIFA Order of Merit, their highest honor, for her contributions to the game of soccer. Akers again was part of the 1999 Women’s World Cup team, leading to a 2nd World Cup championship. Shortly before the 2000 Summer Olympics in Sydney, Australia, Akers retired from the game as the U.S. National Team’s 2nd all-time leading scorer (behind Mia Hamm) with 105 goals, 37 assists and 247 points. In 2002, she was voted FIFA’s Woman Player of the Century, an award she shared with China’s Sun Wen. In 2004, she and Hamm were the only two women named to the FIFA 100, a list of the 125 greatest living soccer players selected by Pele and commissioned by FIFA for that organization’s 100th anniversary. Also in 2004, Akers was inducted into the U.S. National Soccer Hall of Fame.